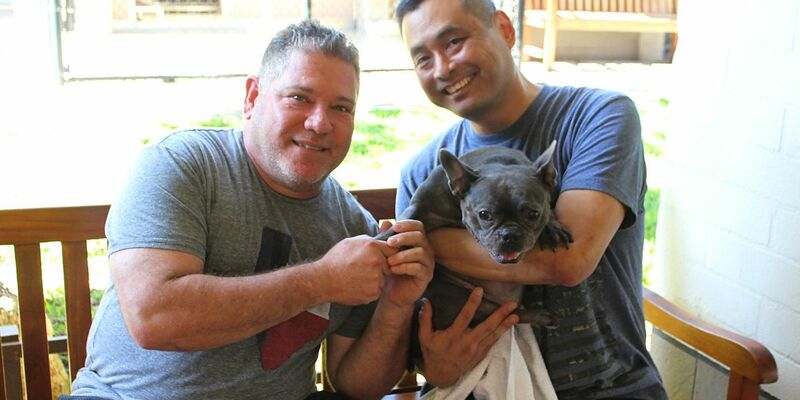 HONOLULU (HawaiiNewsNow) - Here’s an update that will warm your heart: The 3-year-old French bulldog who needed a very special forever home for her very special needs has been adopted. The Hawaiian Humane Society announced the big news Wednesday — and even sent along a photo of the new, happy family. Glenn Honda and George Huffman of Honolulu adopted Collette after spending a few days researching the care she needs. They’ve renamed her Ella — and took her home Monday. Ella’s back legs don’t work and she can’t walk without a special wheelchair. To help her find a home, the Hawaiian Humane Society held a special adoption event to make sure that would-be owners were fully aware of what they were getting into. Dr. Kasey Carter, chief veterinarian at the Hawaiian Humane Society, said Ella’s new parents are a “great match” for her. “We’re happy that the society was able to care for Collette and find her the home she deserves,” Carter said.